Friday night , August 31 , 2007 Critical Mass began its regular last-Friday-of-the-month-ride at 9 pm in front of Marine and Aviation pier 57 at 15th street and the Hudson River . 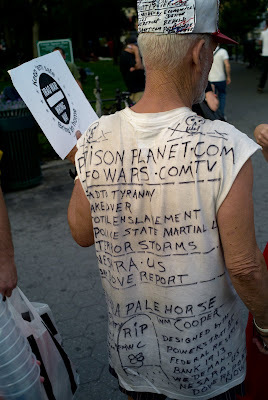 The evening began earlier for CM and NYPD in Union Square Park as usual at around 7 pm. Seventy to eighty bicycles with riders assembled for what appeared to be a ride beginning from Union Square Park . 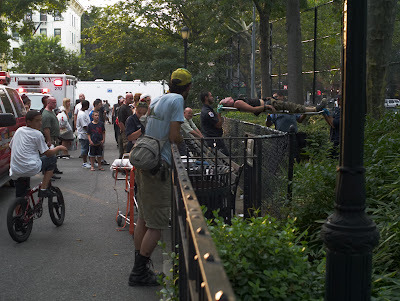 NYPD was present in considerable number waiting for the evening's events to unfold as usual in the parking lot on the north side of the park . 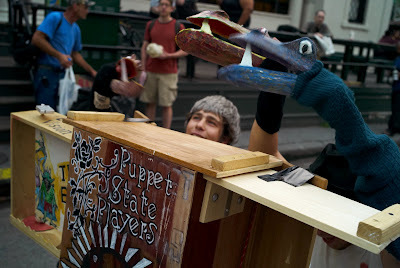 Not much happened in USP other than a puppet show which was more-or-less shut down by NYPD . Both riders and cops waited patiently in the parking lot for more than an hour for the expected ride to begin . But CM leadership had a surprise for NYPD . CM leadership had secreted around the word among the riders that this month's ride would not begin in Union Square Park but at Marine and Aviation pier 57 located on the Hudson river . 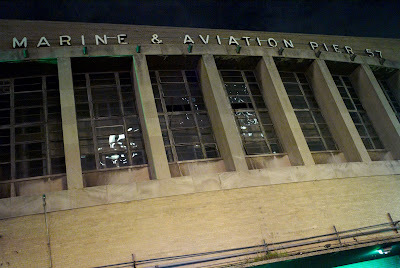 Quietly the body of 80 or so riders , leaving USP a few at at a time only , made their way to what was known during the Republican National Convention (RNC) as "Guantanamo on the Hudson" , Marine and Aviation pier 57. This site was chosen by the CM leadership in memory to all those who had been held in this facility after being arrested for protesting at the RNC on the infamous A31 , day of anarchy . A31 had ocurred 3 years earlier to the day on 31 Aug. 2004 . 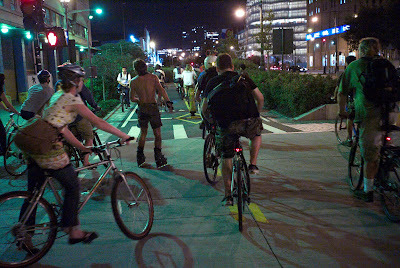 The ride started at 9pm from pier 57 with 80 or so riders and passed through many of the places that during the RNC had been the site of major arrests of large numbers of CM riders . In several places such as Times Square and in front of St Marks in the Bowery the riders stopped and raised high above their heads their bicycles in memory to all those that had been arrested during the RNC ride .It was reported by riders that during the stop in Times Square hundreds cheered the riders . Finally according to some riders interveiwed there were no arrests and in fact hardly any of NYPD were seen anywhere during the entire ride . 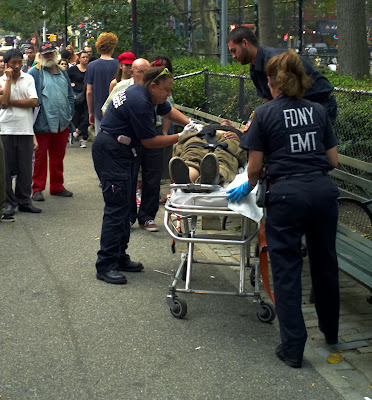 A crowd gathered on the 9th street Tompkins Square Park traverse late Friday afternoon to watch NYFD emergency medical personnel remove an unconscious male from some out-of-the-way bushes just to north of the traverse . The unconscious condition of the male was , as is too often the case in TSP , caused by an incautious injection of too much heroin . The emergency medical personnel at the scence possibly saved the mans life by injecting a sufficient amount of the heroin blocking agent Naloxone to block the effect of the heroin . The young male was removed by ambulance to a local hospital emergency room for continued treatment . It appears that this particular location in TSP has been used several times as a hiding place for drug users to shoot-up un-noticed . 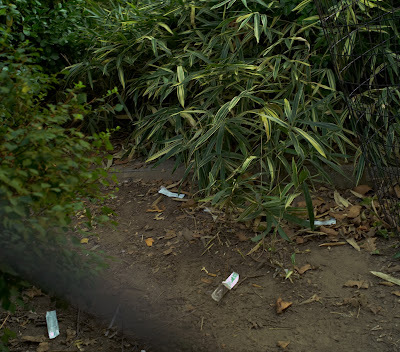 The empty syringe packaging for several syringes can be seen here , left behind in the bushes just to the north of the 9th street park traverse where the unconscious male was found . We recall that "Loan Shark Bob"has always tended to the theatrical in behavior as can be seen above . 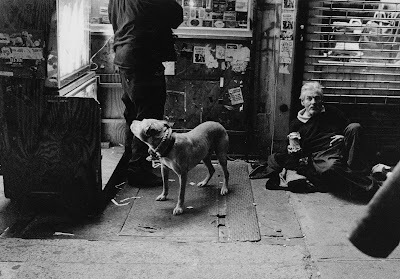 Bob performed believeably on the street in the old neighborhood fooling most ( those who were not his clients ) into believing that he was certainly something other than a mere loan shark , shylocking day-in-day-out . But this is another story to be told at another time . A few years ago his theatrical bent got him locked -up in the Bellevue psych ward . Bob had gone to Bellevue to have a circumcision . When he was told that the cutting could not be done on the day that he had been told to be at the hospital he was angered and began a tirade of protest . 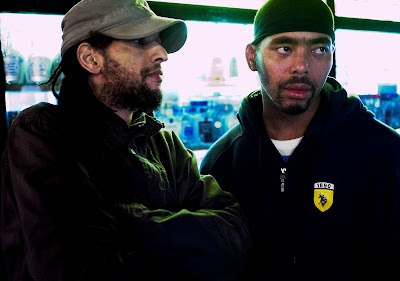 We recollect that in the midst of his theatrics Bob noticed a video crew in the hospital lobby and thus decided to capitalize on their presence hoping to intimidate the hospital staff into changing their descision and began a performance for the benifit of the video crew . Bob got the attention that he desired and then some . The hospital staff decided that Bob had flipped out totally and was on a psychotic rampage . 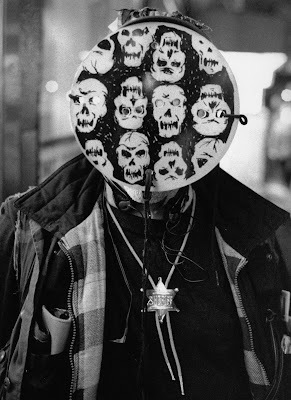 Bob was shortly grabbed , subdued , restrained , medicated and locked up in the psych ward for several days . After a few days Bob was released . He found a lawyer and sued the city hospital system for unlawful imprisionment and whatever other damages that went with his claim . Bob was awarded $1,000,001 by a jury in federal court and for a while was known as "Million Dollar Bob" until a judge reduced the amount to a lesser sum . Last night at Ray's it was Belgian fries and the right pair of shoes that made the evening a sucess . A decade ago there were no fries to be had at Ray's and it was a can of Bud purchased at the window that commonly made things right with the world .